Using three parameters a, b and c, mark each arrow with an operation and parameter, e.g. +a or /c. [You can see a numerical example by going here. If you are using numerical values for the parameters, do not use +0 or -0 or x1 or /1. Certainly do not use /0.] 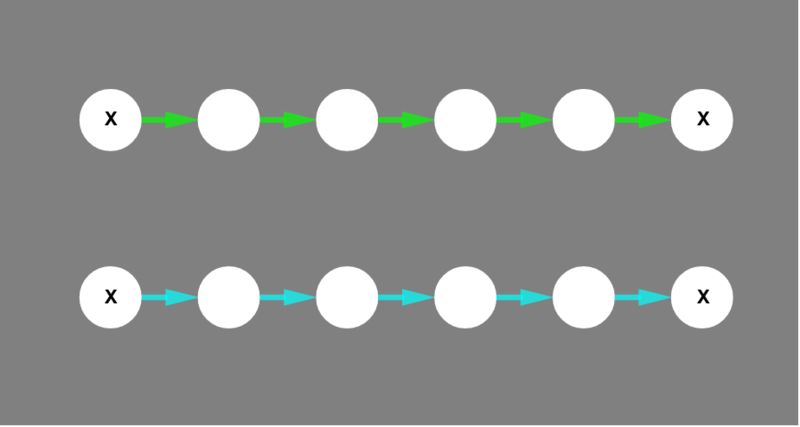 No two arrows may be marked with the same operation and parameter. Construct two different sequences of operations and parameters that each transform any given number through a series of intermediate steps and that ultimately return the original number. Can you devise way(s) to concatenate these sequences to produce a one dimensional periodic lattice of numbers? Can you devise way(s) to concatenate these sequences to produce a two dimensional periodic lattice of numbers? Can you devise way(s) to concatenate these sequences to produce a three dimensional periodic lattice of numbers? What questions could / would you put to your students based on this applet?